I had taken my engine to a local mechanic for an overhaul gasket job. I would have done this myself but the van was all leaky and I did not have the time so I bought a gasket kit and let the guy do the job. Driving the van after that I realised there was a very significant drop in fuel efficiency and power. I immediately knew that the guy had got engine timing and carburettor set-up all wrong. The Vanagon’s ignition system works like any other. If you are not familiar this is how it is; the engine runs by the combustion of an air/fuel mixture. 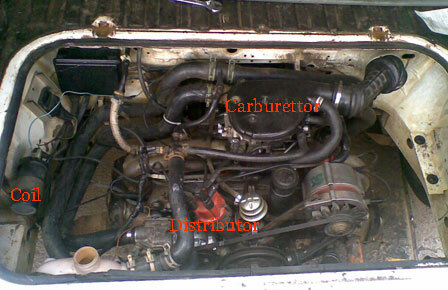 The air/fuel mixture is created by the carburettor in a Vanagon and we are going to discuss this a little later. The spark responsible for the combustion is caused by a spark plug. The spark plug receives the electrical energy that creates this spark from the electrical coil via the distributor that gives this electrical energy to each of the four spark plugs in a pre-determined order also called the firing order. The coil transforms 12V from the battery to a very high voltage (heard somewhere it’s up to 10,000V) before it sends it to the distributor. All this occurs when the piston compresses the air/fuel mixture in the cylinder and at a pre-determined moment, this compressed mixture is ignited resulting in power. The process of Engine timing is responsible for ensuring the firing occurs at the best possible moment.